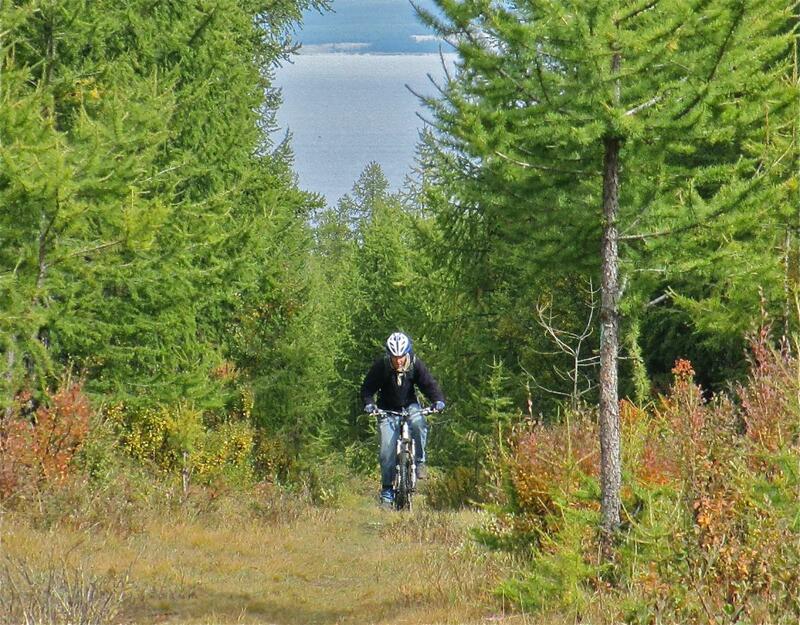 The trail sits in the foothills of the SW area of the Hovsgol Lake. Hovsgol Lake is a great lake located in far northern Mongolia. The trail consists of a good mix of singletrack and doubletrack. There are various side trails along the way to explore. If you ride the trail CCW, head north from the village parallel to the lake. When you reach the main road (well-developed gravel road), you are at about the 1/2 way point. You can turn around here and ride back the way you came as an out and back. Or to ride the trail as a loop, you can continue on and head up the pass on the lake side of the road. There is no trail at first heading up the pass. Just "no track" it up the hill a ways, and part way up the pass you will pick up more singletrack (next to the road). This will lead you up the pass, then down the other side and all the way back to the village. There is another trail up the pass in the forest before the gravel road, but it is a bit confusing to identify on your first ride. From the top of the pass, the trail stays near the road all the way back to the village. Though I have described the trail from CCW route, I recommend riding the trail CW. Review: Great long ride. Some of it is along the lake, some deep in the larch forest surrounding the lake, and some on open grassy slopes with extensive, beautiful views. I recommend riding the trail CW from the west end of the village. Pick up the ST along the dirt road near the little airport. Jankhai Trail MTB Trail 5.00 out of 5 based on 1 ratings. 1 user reviews.